Therefore I am diving straight in today with one of my closest 'dolly' friends, Fanny Zara (aka Mademoiselle Blythe). Fanny is one of those soul friends that you feel you have known forever, though I think we must have only met at the beginning of 2010 through the 52 Weeks of Blythe project. 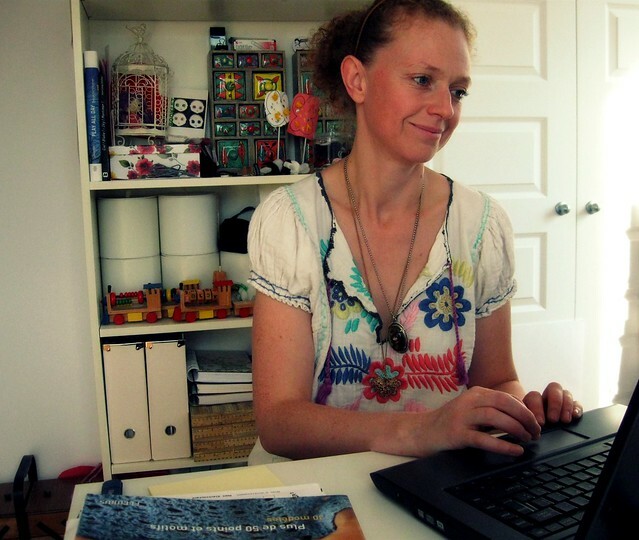 She is a kindred spirit, being fellow Canadian immigrant, creative, mom, blogger and Blythe fan. Arriving on the Blythe scene in 2009, Fanny quickly became known for her beautiful family of dollies which she shared through her many gorgeous photos, and fascinating, must-read, interviews at her blog, Blythe Doll Fashions... Anyhoot, without further ado, please enjoy! Welcome, and thank you for stopping by Fanny! Could you please tell us a little about yourself? Hello! Well, I live in the countryside near Montreal, Canada, in a French speaking province. I was born and raised in France, but left Paris 8 years ago to follow my husband, who has always wanted to live in Canada. We have two children; a 5 year old boy and a 4 year old girl. The whole family is both French and Canadian. I have had many different jobs, from teacher and runway dresser to project manager; my current one is an administrative job in one of the largest international accounting and professional services firms. How did you first get into Blythe, and what it is that you enjoy most about collecting them? My Dad was a fashion designer and a painter. I guess that is the main reason why I studied history of art at the school of the Louvre Museum and why I have always been attracted to art, artists, creativity, uniqueness, style, fashion, design… After having children, I started to look for information about arts and crafts for them and discovered many talented crafters through blogs and Etsy. I liked to read Hillary Lang’s blog, Wee Wonderfuls, and she blogged once about her ADG Blythe doll. I got interested right away and started my research. I wanted to know everything about that doll and it took me quite a long time: I never thought there would be so much info online about Blythe! It took me 6 months to buy my first Blythe as I wanted to know everything first to help me make up my mind. In retrospect, I also think that I would have loved to work in the fashion industry as an artistic director or photo stylist, but because Blythe allows me to do it, I don’t even dream about it anymore. Naturally, what I enjoy the most is dressing them up, mixing and matching designer clothes and accessories… exactly the way I do it for myself. When I am happy with an outfit, I also love going outdoors to take photos because it is the only quiet and serene moment I have in my life these days, and I need it! I notice that your collection consists of either Kenner’s or customs, what draws you to these particular incarnations of Blythe over others, and was it always so? My first Blythe dolls were stock and after seeing so many pictures of beautiful customs, I wanted my girls to be customized too. I also usually prefer matte faces rather than shiny stock dolls on pictures. After having my first custom doll, I was hooked. It is so wonderful to have a unique doll and customs really have their own style and personality. I would love to have at least one Blythe from all the customizers I admire but my budget is way too limited unfortunately. Regarding Kenners, I was first curious to understand what all the fuss was about them. I also loved all their pictures on Flickr. I know that some people are not able to bond with them, but it was not true in my case. I loved the first one right away and never stopped wanting more! They do have a special glow and I love the fact that they are all different because they all had a different life before being with us. 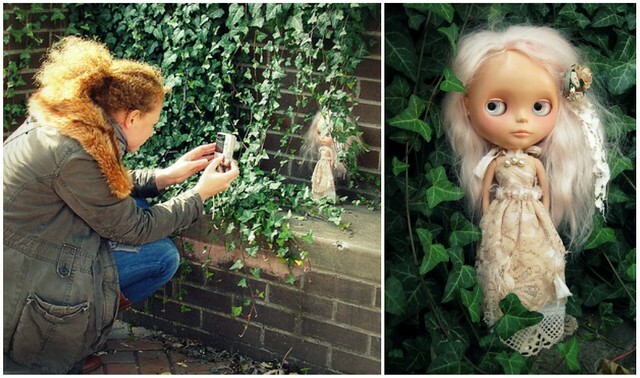 You recently played host to ‘Amelia’, one of three Travelling Blythes for 2011. Can you tell us a little about her adventures and what you liked most about your time with her? I wish I could have done more with her. She stayed for just 2 weeks and of course, I took her to my favourite places in the woods nearby. I was also very happy to be able to take her to Montreal and have a mini meet with April (aka. ElasticCamel) and Corina (aka. TreacleMineRoad). She is very different from my other girls. They look like little girls while Amelia looks more like a self-confident woman. It was fun to style her differently. She is beautiful and I was happy to enjoy a G*Baby custom for the first time. Your photographs are always so beautifully executed; you obviously have a great eye for styling and composition. What is your background in photography? Do you have any tips or tricks that you could share? Thank you for your compliment! Actually, I don’t have any background in photography. I am just trying to do my best with a basic camera. To tell you the truth, I have to take many, many pictures to select 1 or 2. Then, the selected ones need a lot of editing. I use Picnik a lot and I am starting to learn how to use Photoshop. I have the feeling that my studies in history of art help me a lot when it comes to selecting pictures and improving them, but sometimes I come back with 100 pictures and I am not happy with them. I delete the whole batch and go out again to take new ones. When I started to share my Blythe pictures on Flickr, someone recommended avoiding using flash, even with poor lighting. That was the best tip ever for me and my only trick is Picnik! A big part of the Blythe community and hobby is supporting handmade designers. As handmade goods are by their nature a luxury rather than a necessity, what suggestions would you give someone in using that knowledge to brand and market their creative business? One of my first jobs after school was in the brand strategy field, so your question makes me smile. The more Blythe is popular, the more designers arrive on the market and that market is still quite limited. I think that the best way is differentiation. If you have you own style, different, special and recognizable, that will help you start. Then, if you are able to take lovely pictures of your designs, I am pretty sure you will be successful! It sounds simple, but according to what I have observed in our dolly community these past two years, I can tell you, it works. I understand you started your blog as part of an overall online personal branding process. 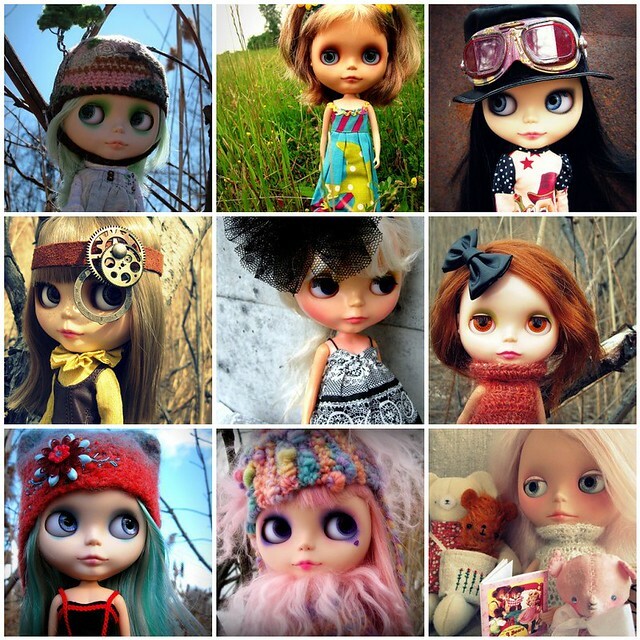 What made you decide to start a blog on Blythe in particular? My partner! You are right; my blog has something to do with personal branding. As my partner at the time was an expert in personal branding and online reputation, he definitely advised me to start my own blog about Blythe. I made a little bit of research and found out that there was no blog that was really “general”. They were all quite specific and almost always linked to selling some products. I had nothing to sell but I was looking for a way to exist in the Blythe community, so blogging sounded the best idea. I quickly found out that I loved it. 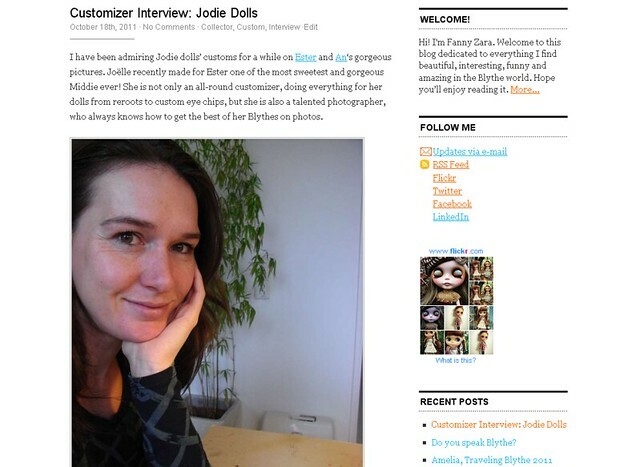 What sparked your initial idea of running a series of interviews on your blog? Do you have any particularly memorable ones that leap to mind? It’s always easier and motivating to do what you like the most. I like artists and I love to know more about them, how they started, what inspires them, etc. I guess that I was not the only one who loved to read about them; the most memorable is always the next one I have in mind! Congratulations again on reaching the blogging milestone of your 100th post! During your experience as blogger, what have you discovered through the process of blogging? Blogging is time consuming… a lot of time when you want to do it in a professional way because it involves research and reflection. It also brings a lot of joy when people let me know that they like my blog entries. It always makes me very happy when I know that what I do is useful, at least for one human being on earth! As a busy mom, employee, blogger and hobbyist; what secrets have you discovered in balancing all that you do? Actually, I still haven’t found any miracle recipe. It’s hard to find time for everything and everyone, so I just sleep less than I should, and I definitely don’t recommend that! Thanks so much Fanny for visiting with me today! Before you go I'd love to know; what is your favourite sweet treat? French macaroons! Thank you very much for having me, this was so much fun to do!